When I lived in Chicago, I would take frequent walks around the various neighborhoods to scope out the gorgeous late 19th and early 20th century domestic architecture. I would habitually develop Architecture Envy. This involves an intense wish to live in a fabulous early Chicago house that one has just seen during a stroll, but knows one could never afford. As I say, I was routinely afflicted with this condition, anyone who has been to the neighborhoods immediately surrounding downtown Chicago knows what I’m saying. There are two neighborhoods on the southwest side that have row after row of bungalow style homes, it’s fabulous. One can see those on the way to Midway Airport from downtown. The Arts and Crafts movement, an English reaction against mass-produced arts, found willing adherents in the United States when it was introduced in the 1880s. The emphasis of the movement was hand-crafting and natural materials, with a preference for historically-inspired styles. The movement led to all sorts of eclectic combinations of influence, such as crossing Japanese art with medieval European art. Nothing is a stranger combination of east and west than the bungalow style. 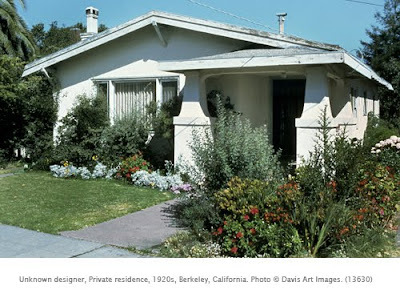 Although most Americans -- including me until recently -- assume that the bungalow was an American inspiration because we see it from the east coast to the west coast, the basic design came from India. The term actually originated in India, where the native population built low houses surrounded by verandas which provided a central living space with surrounding rooms and porches for sleeping. The name “bangla” came from the Indian province of Bengal (now Bangladesh). The British occupiers of India took the style and added aspects of the “English Cottage” style (mostly a Gothic/Romanesque revival style, very “quaint”) and introduced the style to Europe. The bungalow style became popular in Europe as a design for summer retreats, and as such, was introduced in America by Boston architect William Gibbons Preston (1844-1910), who built a version of it on Monument Beach, Cape Cod. Books illustrating the style and plans of bungalows were published widely in America, and multitudes of identical bungalows were built across the country. Eventually the form came under the influence of the Arts and Crafts movement. Despite the variations, there are several common features, seen in this example as well: heavy eaves on a low-pitched roof; asymmetrical facades; prominent verandas with heavy supports; and combinations of materials – brick, stucco, and stick work. The style lost favor in the 1920s with period revival styles that resumed popularity until the 1950s. Interestingly, at one time, the Sears catalog sold complete bungalow homes of pre-cut pieces ready to be assembled on the home site!